The photo above was taken by paleoartist Emily Willoughby in 2015. It shows Harvard fossil MCZ 4371, the foot of a specimen Deinonychus. Check out her website of paleoart here. I was a fairly typical kid of my generation; I loved to read about dinosaurs. It was this, let’s say ‘healthy’, obsession that led me to frequent public libraries, dragging mom or dad along, and devour everything I could find about these ancient amazing creatures. And I gradually took notice that they had books on other topics too, and became a young bibliophile. But it was the dinosaurs that first led me to love the library at age 5. The word ‘dinosaur’ was about 123 years old when I first heard it. In 1841 Sir Richard Owen, at the time a respected palaeontologist and fossil hunter, first proposed the term ‘dinosaur’ in a paper for the British Association for the Advancement of Science. In historical context, at that time the struggle for Responsible Government in British North America was well underway. A few months after the word ‘dinosaur’ was introduced to the world, Lord Sydenham, first Governor General of the the united colony of Canada, and arch-nemesis of the Reformers, would suffer his fatal riding accident. In that same year Joseph Howe would sell his newspaper, the Novascotian, after thirteen years as editor and owner, to participate more fully in Nova Scotia’s colonial government. The meaning of the word ‘dinosaur’ had drifted a little bit between 1841 and the 1960’s. A typical kid of my generation would tell you, showing off a little, that the word ‘dinosaur’ means ‘terrible lizard’; the ‘dino’ part means ‘terrible’ and the ‘saur’ part means lizard. But, as a youngster, I was always quick to offer the further clarification that the ‘terrible’ did not mean ‘to be bad at something’, that the dinosaurs were not, in fact, terrible lizards at all; they were totally cool and very effective lizards. The ancient Greek word deinos was intended to mean that the power and greatness of these ancient monsters should inspire well-justified respect. They were awesome lizards! Well, to impressionable children, they were awesome. But for adults, it was the irony of the dinosaurs’ story that was most deeply appreciated. The dinosaurs were, let us face it, quite extinct in the present. They had so dominated for so long, and yet somehow they screwed up. In the ultimate reversal of the tortoise-and-hare tale, it was the reptile, with a huge head start, that lost, utterly and profoundly, to the mammal. Never in all natural history was so big a lead so badly blown! And we looked at how big our brains are and how tiny their brains were, and concluded that dinosaurs went extinct because they couldn’t adapt. Not at all like us! The failure of the dinosaurs was a reverse-metaphor of our modern-age success. Now there’s a story adult mammals can buy into! It really was a time of revolution in palaeontology. This book introduced me to the fossil remains, unearthed in the late 1960’s, of a newly-discovered dinosaur, Deinonychus. 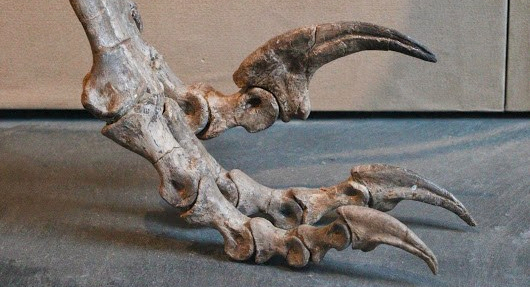 The name ‘Deinonychus’ is ancient Greek for ‘Terrible Claw’, and the talon was really terrible: an extra-long, forward-reaching hallux, curved, sharp, and deadly, towering over its more modest fellow phalanges. ‘Terrible’ was a fine adjective, in that the claw did inspire awe, and also in that it tore through our long-accepted wisdom about dinosaurs. Today’s lizards and their kin usually lie in wait for unsuspecting dinner guests. The owner of that claw ran down its prey; it leaped and killed with its special toes. It didn’t seem possible for a 100 kg reptile to be that athletic, more the act of wolf or leopard, of a high energy carnivore with a warm-blooded metabolism. And the more that people pondered on that claw, the harder it became to refute its implications. Long-unanswered anomalies, like blood circulation and predator / prey ratios, seemed to make more sense if the dinosaurs were not lizards, but warm-blooded animals. It was a new era of new thinking about the story of life on our planet, the beginning of what has come to be called the dinosaur renaissance. Another very significant part of the paradigm shift was the realization that modern birds were the direct descendants of the ancient dinosaurs. So strong is this familial connection that it is fair to say that at least some dinosaurs did not go extinct 65 million years ago, that their evolved children are with us today, that modern dinosaurs are singing in the trees, and hunting for worms in your back yard. That is an idea somehow deeply satisfying to me, but is not the point I am trying to make in this post. What I want to draw your attention to, rather, is that the word ‘dinosaur’ evolved. We originally named them awesome lizards, and their name became a metaphor for the inability to adapt to changing circumstances. But they were really awesome bird-like animals, some of who survived a most horrific cataclysm, and who did indeed adapt and who are with us now, thriving in abundance. As an adult, I have from time to time gone out, with bread crumbs in my pocket, to feed dinosaurs in the park by the lagoon. The ones I like to meet most are Branta Canadensis. The name is Latin, not ancient Greek. ‘Canadensis’ is a bit of a give away; it means ‘from Canada’. The other, ‘Branta’, is a Latin rendering of the old Norse word ‘Brandgás’, which means ‘burnt goose’. Now, one would be quite justified, at this point, in noting that Latin was the language spoken by people who lived in the Roman Republic and later Roman Empire. Those Romans had no inkling about the land that would, more than a millennium later, be called Canada, and they did not know, centuries after the empire’s passing, what Norse folk would say while sitting about their cooking fires complaining the chef scorched the waterfowl. The name Branta Canadensis was made up by Carl Linnaeus around 1772. He used ‘Brandgás’ / ‘Branta’ to differentiate geese with black and brown feathers, from geese with typically grey and white plumage. He called the grey and white geese ‘Anser’ which is actually the original Latin name the ancient Romans used for geese. So, there are geese, and there are burnt (as in burnt-coloured) geese. Linnaeus was a Swedish naturalist who is largely responsible for creating modern taxonomy, a multi-class sorting tree data structure, based on observable similarities for the organisms at each level. And he introduced binomial nomenclature, so two and only two ‘Latin’ words would be used to identify each kind of plant or animal. Biologists around the world today use an enhanced version of the Linnaean system. It is modified from Linnaeus’s original to more sharply and consistently define the classes, based on our modern understanding of each organism’s phylogeny. Linnaeus was but a midway participant in the Enlightenment; it would be 60 or more years after his naming of Branta Canadensis that Charles Darwin would explain Evolution and Owen would name Dinosaurs, and over a century before Gregor Mendel would explain Heredity (and no one would really grasp what he was getting at for another generation or so after that), but Linnaeus’s early intuitive approach to the nested hierarchy of taxon ranks was pretty sound. The current system could be described as what Linnaeus would have come up with if he had known what we know now. Linnaeus included spaces in his original hierarchy for manticores and dragons and satyrs and the like, though he grouped these in a class called Paradoxa. He figured fabulous creatures could be more properly placed when details of their natures became better established. He didn’t dismiss them outright, but took the position that time would tell. Again, his intuition was right. The dragon bones people had found turned out to be dinosaurs. One of the unusual people-like animals in Paradoxa turned out to be gibbons. Significantly, Linnaeus included humans in his taxonomy. Homo Sapiens were in there as just one of the Primates, in with all the other animals. That was radical for his time, and a huge step in understanding. He actually invented the word ‘Primates’ for the 10th edition of his catalogue. At first he had called the group ‘Anthropomorpha’, which means man-shaped, but revised the group name to ‘Primates’ after considering the constructive criticism of some of his otherwise supportive fellow biologists. (“Man is man-shaped? Really, Carl?”) The name ‘Primate’ means, roughly, ‘of the highest ranking’ among the mammals. This name was an 18th century compromise answer to a challenging theological problem. Grouping humans with monkeys and apes contradicted the idea that humans had a God-given higher spiritual nature. Even worse, if man (which is to say, humanity) was created in God’s image, and monkeys and apes looked like humans, it kind of logically follows that God looks like a monkey or an ape. For Linnaeus, the physical evidence of a deep biological connection between humans on the one hand and monkeys and apes on the other, had to be recognized in his taxonomy. The name ‘Primates’ was his way to tip toe through dangerous philosophical terrain, and the name stuck. As for him making up Latin words Romans never said, well, Latin was the second language for educated people in Europe in the 1700’s. And, important from Linnaeus’s viewpoint, not a lot of European’s spoke his native Swedish. So, he made up ‘Latin’ words, but he did it in all sincerity, expecting these names to be more widely understood by his contemporary peers because of that choice of that single language over any other. And, he simply didn’t have the funds needed to print out multiple translations of his books. So, he wrote in Latin (and still he was often looking for wealthy patrons to help with publishing costs). And, living in Sweden, old Norse was a natural source for him to turn to for descriptors to translate into ‘Latin’. Word meanings change over time. Semantic drift is real. Part of the challenge I have with this website is trying to use words and finding I need to establish functional definitions, and those definitions are often not what the words commonly mean. ‘Democracy’, ‘Responsible Government’, ‘Accountability’, ‘Electoral Reform’, like ‘Dinosaurs’, have undergone some evolution. The words don’t mean what they initially meant. That seems to be the fate of good words; they kind of wear out semantically as culture changes. Semantic clarity is really useful. Linnaeus’s work is a great example. He made up a powerful tool to help us understand the natural world. His often ‘arbitrary’ choices for signifiers, his occasional quaint organizational miss-steps, did not at all blunt the value of the logical framework of taxonomy to the practice of biology over the following centuries. Each one of those two-part fake Latin names really mean something, really leads you to an organism of a very particular kind, every time, with great reliability. He got that meaning mattered. Especially in this era of computer programming, we should get that too. As valuable as words are, there’s a whole lot of vital communication done without words. We are animals that use words a lot. (I do!) We sometimes fail to notice what is going on around us all the time. Human armies communicate with each other, as I mentioned in the previous post. Non-human animals communicate without words with each other, and with us. I sometimes go to the park, with bread crumbs in my pocket, to feed some representatives of the modern dinosaur Branta Canadensis. The local primates call them Canada geese. I will continue with that story in the next post.